I saw so much stuff on Day One that I’m still writing it all down – and here I am at the end of the show. It’s time to go home but my feet are recovering. Picking up where we left off the other day, Inventory Adjusters is the 800 pound gorilla of selection at the Holidome show. They sell all new stock, much of it harvested from jewelers who’ve fallen on hard times and are liquidating. I saw Ebel, Oris, Omega, Breitling, a beautiful IWC perpetual calendar in pink gold, Gevril, Cartier, Raymond Weil, and Movado. 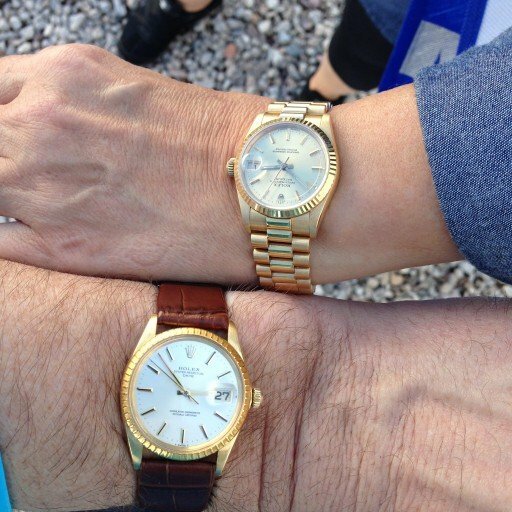 There was even a smattering of Rolex, including a Lady Yacht-Master in yellow gold that my wife nearly took home. Down the isle was Envision Enterprises. Steve Shimonov runs the company out of Sarasota, FL. He had a more modest selection than some, but his pieces were among the best I’d seen at the show so far. Next, I encountered Mardoian Jewelry. They supplement their selection of Rolex with Breitling, Omega, and Cartier. They also offer a nice selection of jeweled bezels in case you want to add a little sparkle to your watch. 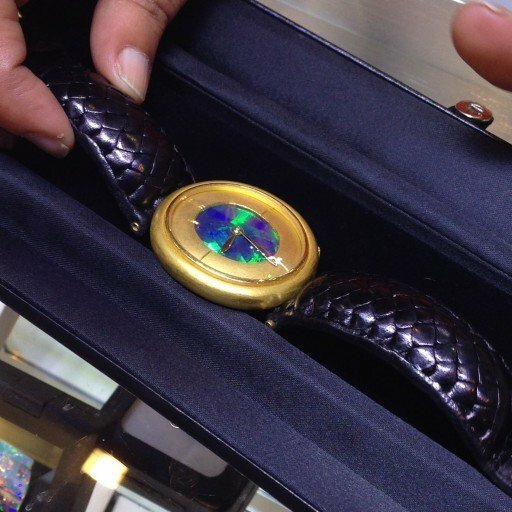 In fact, if they take in a watch that’s too plain, they often jazz it up themselves, before putting it in the case. Karkour Fine Jewelry has a huge selection of Rolex, maybe the largest I saw. The Rollies were balanced by a nearly comparable selection of Cartier. And their booth looks like a small store, with low and tall cases all full of DayDates, Datejusts, Submariners, GMT-Masters, Daytonas, and some of the first Yacht-Master IIs I saw at the show. Karkour doesn’t buy off the street. Too risky, he says. Instead, he buys from known sources and past clients looking to upgrade. By late afternoon, we called it a show. It had been raining steadily all day – unusual for the desert – and the parking lot was a mess. We negotiated it without ruining our shoes, and searched out a drink and a meal. We ended up at the bar at the Claim Jumper, a popular steak place on Broadway. Next to us were three guys in a great mood. When one saw me yawn, he asked about my day. We chatted a bit, and found out we were both watch guys. 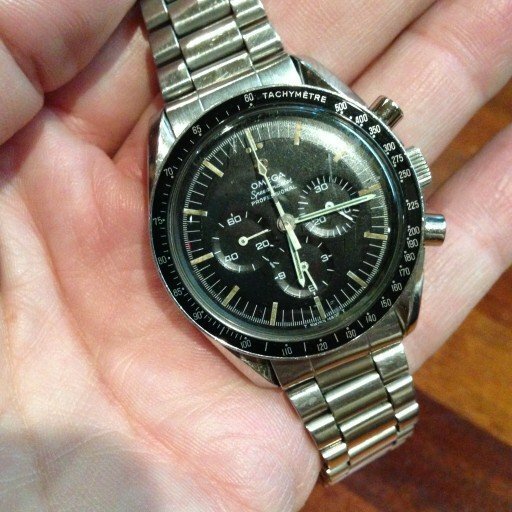 And lo and behold, on his wrist was a 1967 pre-Moon Speedmaster c. 861. A grail watch, to be sure. Funny who you run into when you’re 1000 miles from home. And the stories weren’t done yet. The next day we needed to go back to the Holidome to pick up something my wife wanted. 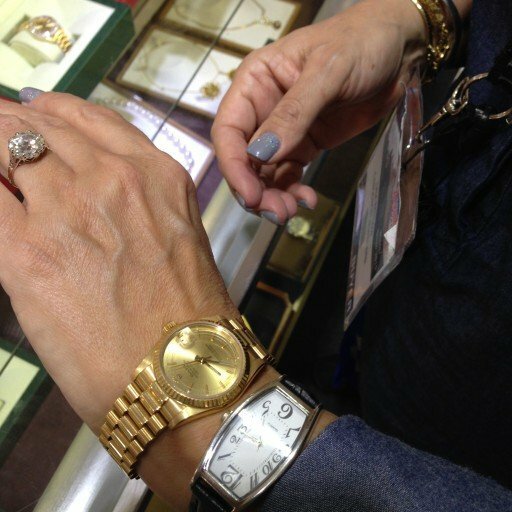 I took her over to Majid Zarnegin’s booth to show her the Oyster Perpetual Date and the midsize Datejust I’d seen there the day before. She took one look at the Datejust, fell in love, and said, “I feel like splurging.” My jaw dropped and I went monosyllabic. She let me in on the deal. The Oyster Perp is on my wrist as I type this post.